Originally, Mount Zion was the name of Temple Mount – Mount Moriah, but in the Middle Ages Mount Zion migrated to its current location, South West of the Old City, near the walls. Its importance to Judaism, Christianity and Islam makes it fascinating, and of endless traditions, and legends. The starting point of the tour is Zion Gate, which may look like an ordinary gate, but in fact it is a structure planned with practical thinking. You may see the many bullets signs around the gate, a memorandum from the War of Independence, which gave the gate its second name “the wounded gate.” On the upper part of the gate stands a little porch, called “Machicoly”. The origin of the word comes from French, and means to break a neck (macher + col). Machicol in French means porch. The Machicoly was used for dropping heavy objects on the enemy, breaking their necks. From this porch, the defenders of the walls used to spill hot oil on their enemies during the siege on the city, just like in the movies. Apart from the Machicoly, notice also the two small windows above it, which were used for lowering two massive metal rods to prevent the entry of the carriages into the city when the gate was breached. These are not the only defense tactics of the gate. Its inner part is shaped in the form of the letter L, creating a sharp curve to the right, so that in case of a breach, the enemies will be forced to slow down in order for the sharp turn, making them defenseless against counter attacks, and giving the locals time to run or resist. Considering that most warriors hold their sword in their right hand, and the shield with the left, the path coming from the right allows the citizens to attack the intruders, whose right side is defenseless, and their shield is in their left hand, which is farther from the path. Continue south from the stone path above the garage. You will probably meet with a salesman selling bagels or sweets to passersby. a few steps later you will reach a point where the path splits. The right path continues alongside the monastery wall, leading to a romantic and beautiful corner of Jerusalem, a magnificent sight at night, watching over Dormition Abbey through the two walls on both sides of the path. Between the two small walls, the Catholic Dormition Abbey peeps through. On the upper part of the wall to the left is a statue of a man carrying a cross, and 5 engraved crosses above it – 4 small crosses and a larger one. This is the Jerusalem Cross, formerly the symbol of the Crusaders, presently the symbol of the Franciscan Order whose members look after the sacred places for catholicism, in the name of the Vatican and the Pope. The figure in the sculpture is St. Francis, the founder of the order, who lived in Italy during the 12th century. Franciscan monks can be seen all over Israel, easily identified by their clothing, just like Sean Connery in the movie “Name of the Rose”, a brown robe, a hood, and a white belt with three knots, symbolic of the three vows – chastity, poverty and obedience. Continue towards Dormition Abbey, walking straight onwards, on the path curving slightly to the left from the church, until you reach David’s Tomb. David’s Tomb is probably the only building in Israel, or even in the world, to have a synagogue on the first floor, a former church on the second, and a mosque on its roof. It is important to keep quiet, since people live here. There were a lot of legends and myths circulating about David’s Tomb, but apparently the building is not King David's tomb, since in the Book of Kings 1, chapter 2 it was said: “Then David rested with his ancestors and was buried in the City of David.” The City of David is hundreds of meters away from Mount Zion. You will notice the big Mezuzah at the entrance, with its three crowns of Torah books, smuggled to Israel from Jewish communities, which were destroyed during the Holocaust. The metal staircase leaning against the wall to the left (there are public toilets in front of it, by the way) leads to the Hall of the Last Supper, and to its amazing stained-glass windows. If the metal door leading to the roof is open, you can climb up to the observatory near the turret, minaret in Arabic, of Mosque Nabi Daoud - David the Prophet. The roof is called the “Temple Mount Observation”, since it was the closest to the Temple Mount and Western Wall in 1948-1967, the period when the Jordanians ruled over the Old City, while the nearby Mount Zion belonged to Israel. On the roof, next to the minaret of the mosque, there’s a tiny room with a stone dome. This is the room of Israel’s second president, Yitzhak Ben Zvi, who used to come here in the late fifties. Today, the room can be visited during noon hours. South, towards the stairs we already climbed, you can see the Armon HaNatziv Promenade, and on the left, Herbert Samuel's palace, now the headquarters of the U.N. in Israel. The road creates an optical illusion, known among locals as the 'enchanted road,' enabling one to turn off the car engine going down the road, making it seem like the vehicle was going backwards. The road is still there, but it is now part of an Arab village, so we do not recommend that you try it out. To the East you can see the most ancient Jewish cemetery in the world, located on the Mount of Olives, as well as the Intercontinental Hotel /Seven Arches on top of it. A little to the left we have the tower of Augusta Victoria with its triangular roof, and more to the left, in the Old City, a glimpse of gold is visible – The center of Temple Mount. 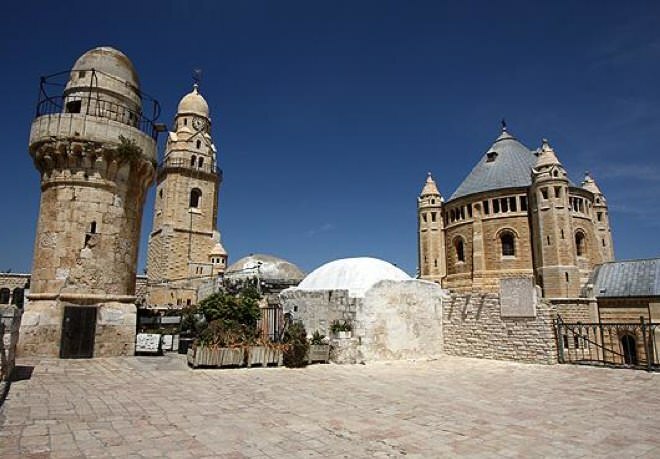 The Abbey of the Dormition is seen in all its glory, and behind it stand the King David hotel and the YMCA tower. “Dormir” means sleep in both Latin and French. In this case, it refers to Virgin Marie, Mother of Jesus, who fell asleep for the last time in Zion. 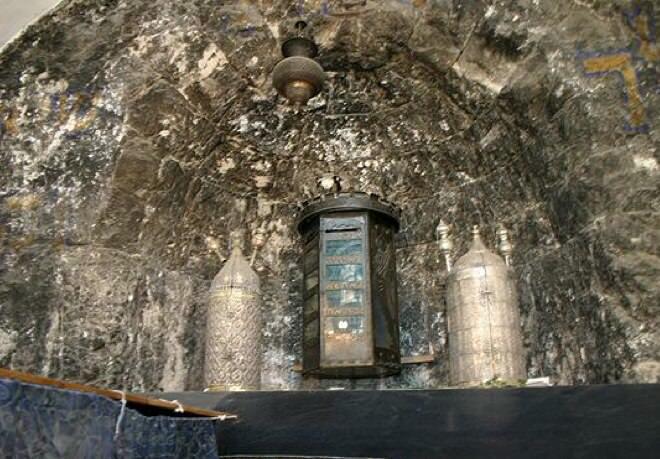 Another version says that Maria's final sleep took place in Miriam’s Grave in Kidron Valley, or in Ephesus in Turkey. On the lefthand side of the monastery you is the Bell Tower, and if you're lucky you might be able to hear them ring before the prayer. A well-known Jerusalem anecdote says that the tower is actually called Bobby, like the nickname of British policemen. The dome of the tower looks like a hat of a British policeman, the clock is the nose, and the windows from two sides are the eyes. A bit lower a triangular mustache and a mouth. A Few steps to the left, and Bobby changes his face – two clocks become eyes, and the window under them – a nose. On top of Bobby's head is a Jewish metal rooster, probably a kosher one. The rooster is the work of a Jewish blacksmith, who got a special order from the church in 1909. Why a rooster you may ask? According to the New Testament, Jesus Christ told his disciples that until the call of the rooster at dawn, Peter will betray him. The monastery is open for visitors. Who else was here on the roof? In 1992, David Koresh and 86 of his disciples committed mass-suicide in Texas, USA, after a long battle with FBI agents. Koresh, who claimed to be the messiah, was a guitarist and a singer, who filmed video clips on this roof (at least two of them available online). After he came back to the US, he gathered weapon in a ranch in Texas and prepared himself and his disciples for the Armageddon. The unfortunate end is known. The exit will lead you towards the Hall of the Last Supper, also called the Cenacle. 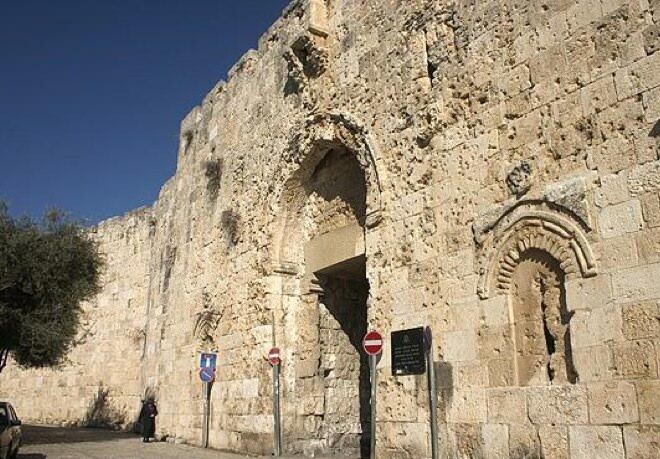 The Cenacle is a Crusader building from the 12th century. Notice the impressive arches and Mihrab towards Mecca, since this place was also previously used as a mosque. 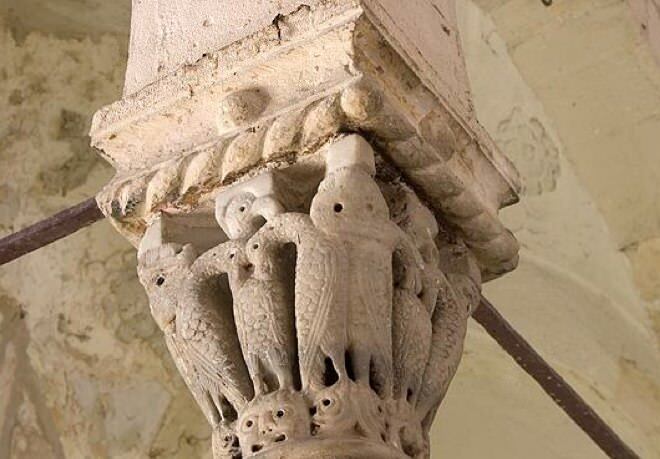 When entering, you will see a Crusader column decorated with Falcon birds. Every bird has chicks pecking its belly. In many paintings, Jesus is portrayed as a rooster with chicks (his disciples), and sometimes as an innocent lamb led to slaughter. Here, the Falcon represents Jesus, and the chicks are his believers, who bite his flash for their own sake. 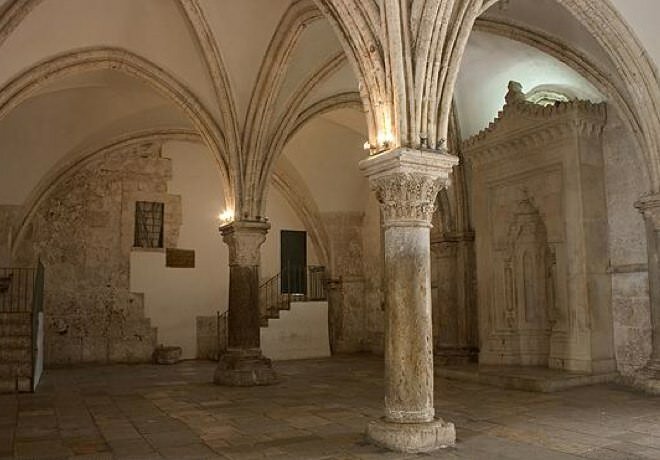 According to tradition, in this hall Jesus ate the last Passover Seder before he was crucified. Here he gave his disciples to drink the wine, symbolizing his blood, and eat the bread, symbolizing his flesh. To this day, this ceremony is recognized in Christianity as the Mass, as well as the famous painting of Leonardo Da Vinci. The Pope visited here in 1966, granting Israel the permission to pave the road from the Sultan’s Pool back here, despite the Jordanian border lying nearby at the time. Apart from where we visited, Mount Zion has many other interesting places: the grave of Oscar Schindler, the Church of St. Peter in Gallicantu, and a few interesting cemeteries, spread around Mount Zion. We also recommend visiting the place at night. Although the monastery, the tomb and the Last Supper hall usually close when it gets dark, there is no comparison to the beauty of Mount Zion lighted at nightfall, and to the observation point from the roof watching over the entire city of Jerusalem.